Baseball. The sport of spring and summer. Baseball started last week and two out of my three munchkins have been eagerly dressed in their newly pressed uniforms ready to go even before the season started. Gritting my teeth, I mentally prepared myself for the packing up of equipment and mapping out the different parks across two cities. This is the year my girls are split in two different directions. No longer able to be on the same team in the same league, their two-year age difference brings about the first indicator what my future holds trying to manage three different sets of activities. At the end of last week I was left wondering if it was yet possible to clone oneself in order to be in different places at different times? Fortunately, the first game for my five-year old was on a pleasant evening. Driving frantically from swimming class to the nearest drive-through to grab dinner and a coffee before trying to program the GPS to find the obscure park where the Angels t-ball team were playing. My little guy was tucked safely at home with our standard Tuesday night babysitter and my elder girl was munching away on her french fries in the back seat of our van. Driving around one hand on the steering wheel and the other clutched around my chicken wrap, I found the park, scanned the no parking signs until a side street brought relief where we carefully steered into a vacant spot. As I gobbled down my dinner, I was calculating the least amount of items I would have to bring on the brief walk to the diamond. Chair. Check. Blanket for Elizabeth to sit on and try to complete her homework. Check. Elizabeth’s homework. Check. Audrey’s batting helmet and glove. Check. Water for everyone. Check. Thanks goodness it was not my night on snack duty! After settling into a damp grassy spot behind home plate, Elizabeth and I sat down to watch her younger sister. Then Elizabeth was up, kicking stones trying to get her younger sister’s attention. Wanting to talk to the coach who was her coach last year. Wandering in the grass. After many attempts and finally a veiled threat to take her back to the car, she sat down to do her homework. Her attention diverted, I could finally watch my sometimes timid five-year old strike out on her own without the comfort of her sister. She kept up with the group, looking back once in a while to assure herself we were still there. Eventually I saw her start to relax and have fun running the bases jumping up and down making them squeak. Elizabeth finished her reading. I had finished my last coffee of the day. So, I drew out Elizabeth’s glove and my own thinking what a great opportunity for us to play catch. I had played baseball as a youngster. Although never the best on a co-ed team, I had enjoyed being outside and the team spirit. It wasn’t until last year at a Jays game with my parents and daughters I remembered that once upon a time, I had loved baseball. 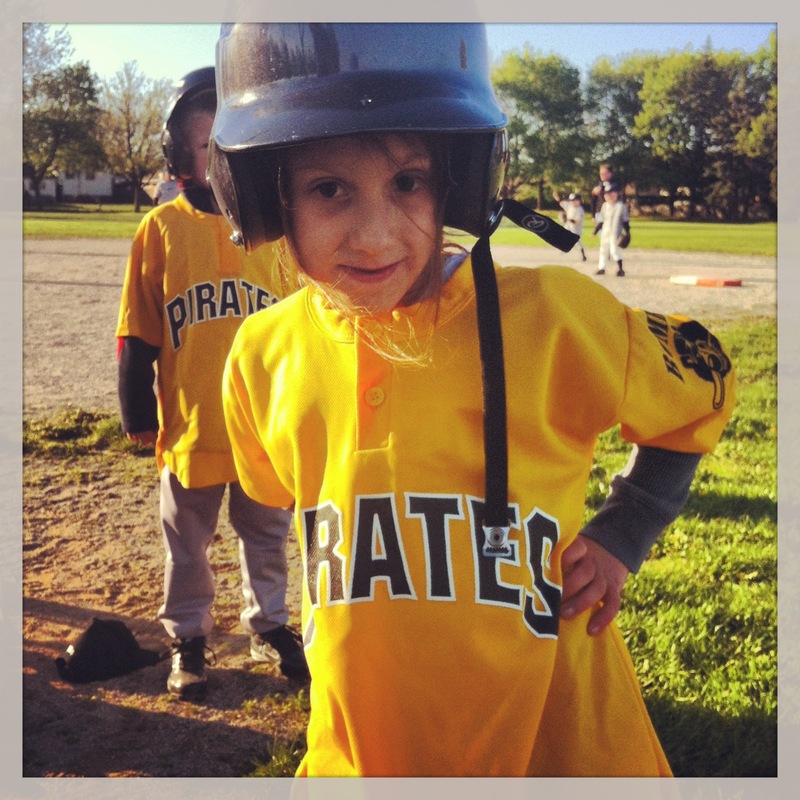 The next night it was Elizabeth’s turn to play baseball on her new team. A completely different kind of baseball night, it was rainy and damp. I pulled out my umbrella and kept hoping they would call it off. As I switched vehicles with Mr. L who had come to take the younger kids home, I tried to answer his insistence the game should be cancelled that Elizabeth was now in “real” baseball having moved up to Soft Toss. They don’t cancel games unless there is a thunderstorm. He had shrugged, happy to escape the hour and half commitment and securing my place as the baseball parent. Elizabeth is also in a different city league on a co-ed team due to other previously committed activities. This means she plays twice a week rather than one and I have to try to navigate numerous parks instead of just one throughout the season. 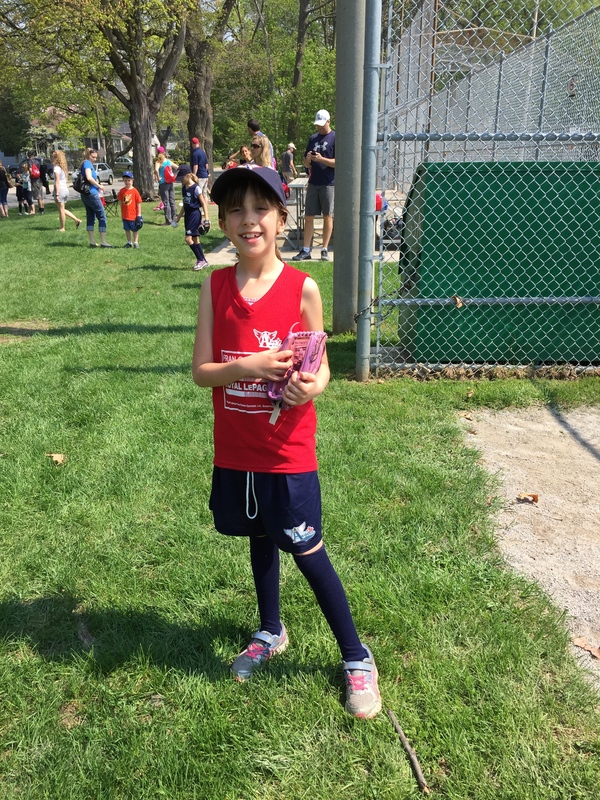 A Pirate this year, she happily pulled on her yellow jersey as we sauntered up to the coach and ran out into the field where she watched each play, running towards the ball albeit not making any attempt to pick it up and throw it. Like mother, like daughter. I sat smiling chatting to another Mom while we shook fat rain droplets off our umbrellas. 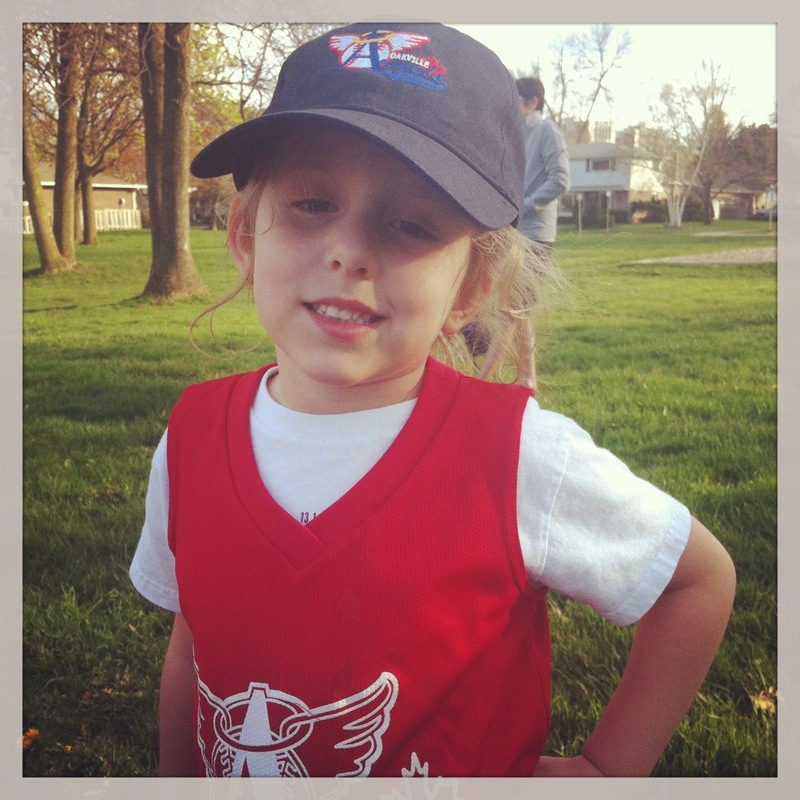 This year, soft toss means she is “off the tee” and hitting from a slow-moving pitching machine. The coaches, a little more rigorous in their approach, gamely take her aside and well, coach her. She is after all, only one of two girls on the team. However, she watches the boys who can hit the home runs in awe and I hope she soaks up some of their glory and feelings of victory. Watching her high-five the only other kid she knows, a boy from her class at school, I sit back and let her go. Unlike her younger sister who looked for me every ten minutes, Elizabeth was not looking back but listening to her coaches tell her where to go and where to stand. She grew up a little bit for me after that game, even after watching her eat the watermelon in the rain afterwards her face stained red from the juice as she wiped her hands on her jersey, looking up at me with a guilty look on her face as she chatted to her teammates. All I did was wave and shrug and I let her be. After all, being with your team and getting wet and dirty, isn’t that part of baseball? As I plunge into baseball season I wish for good weather, fun times, learning where to grab hot coffee and most importantly, that my girls continue to love the game as much as I do.